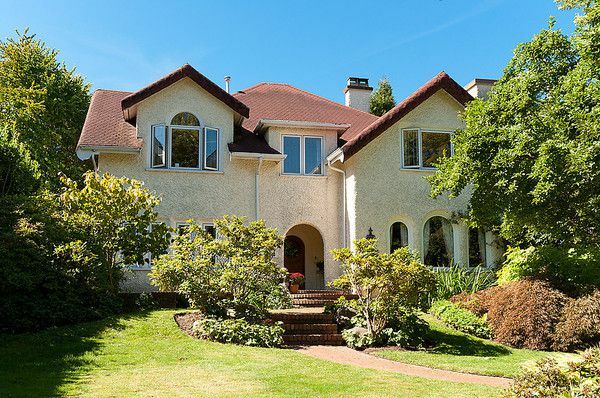 A rare opportunity to acquire this most desirable home & property in West Point Grey. An exceptionally large (over 11,000 sq. ft.) SW facing property and 5000 sq. ft. Traditional style home. Some water & City views on the prettiest treelined street. Peaceful location but minutes to downtown,UBC,West Point Grey Academy,St. Georges,Lord Byng & Queen Mary Elementary schools. Gourmet kitchen with Carrara marble & Teak counters, Aga stove & beautiful hand crafted custom cabinets. Spacious bright kitchen and family room with French Doors open to PRIVATE backyard.Wine cellar,gorgeous custom oak panelling in main floor den & irrigation in front.Truly an elegant & timeless family home for a discerning buyer.